BYU Football is carrying more questions into fall camp than explanations. The structure of the team has not been revealed, and may not take shape until after the camp comes to a close. In the past, BYU often had a clear-cut starter at quarterback. Assistant coach Ed Lamb spoke with the St. George Spectrum about the tight quarterback race. He explained that Joe Critchlow could be one of the all-time greats at BYU before he graduates. Critchlow burned his redshirt last year after injuries consumed the QB position. He is a sophomore and won two of the three games he started last year. Coach Lamb said that the position would only be taken away from him if Tanner Mangum plays amazing in camp. Mangum was voted the 2015 freshman of the year after making some incredible game-winning plays. He played behind Taysom Hill in 2016 and suffered an Achilles injury in 2017. Despite poor offensive performance in 2017, Mangum looks to be in the best shape of his college career currently and has recovered from his injury exceptionally according to coaches. Zach Wilson has shown promise, but Lamb did not mention him as a possible starter in his statements. Another position in limbo is the running back position. Beau Hoge started the season as a QB contender, but he has been taking reps at running back. Lamb said he will be taking the field at other positions, and appears to have ruled him out of the QB race. Zach Katoa is a redshirt freshman and played exceptionally in the spring game. BYUtv sports analyst Jarom Jordan feels said on BYU Sports nation that Katoa “will be the starter” RB despite his lack of in-game experience. Other running backs in the mix are KJ Hall, Riley Burt, and Squally Canada. All three of these running backs have game experience and have shown promise on the field. Canada was recently named to the Doak Walker preseason watch list. Multiple players may be used in all sorts of different situations, but according to some, Katoa may be taking the bulk of the carries. Grimes did not show much of his offense in the spring football game, and it does not appear to have an identity yet. 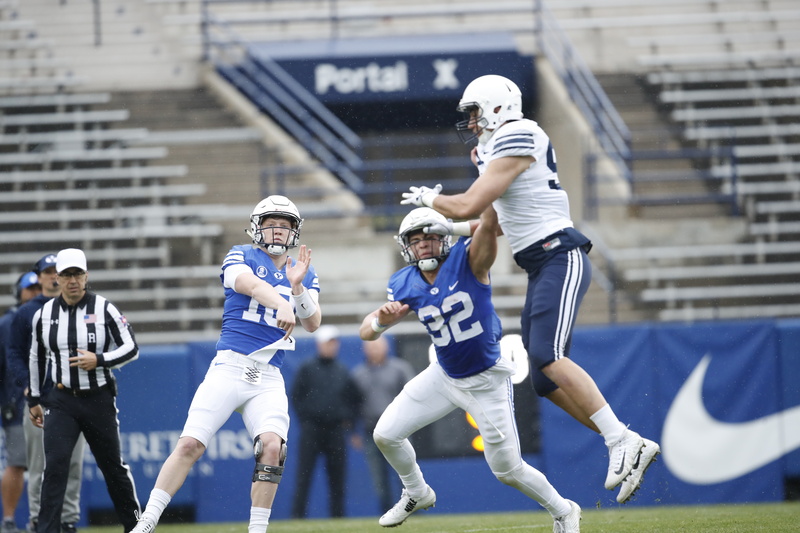 BYUtv sports analyst Spencer Linton said on BYU Sports Nation that he wants to learn more about the offense in fall camp, but that he doesn’t know if we will. Although there are many questions going in to fall camp, many players and coaches are excited about what lies ahead for BYU Football. It remains to be seen how quickly starters will be named in fall camp, and if the offense can find an identity this year after never finding its stride in 2017. Hopefully fall camp will give light to what lies ahead for the program.